4) “China''s Aid to Africa: Policy Evolution, Characteristics and its Role”, in J. Stillhoff Sørensen ed. “Challenging the Aid Paradigm: Western Currents and Asian Alternatives”. Houndmills: Palgrave Macmillan 2010. 7) “China’s African Policy: Driving Forces, Features and Global Impact”, 《Africa Review》 Vol.1, No.1, Jan.-June 2009, Journal of African Studies Association of India, also collected in “Fifty Years of Sino-African Cooperation: Background, Progress and Significance――Chinese Perspectives on Sino-African Relations”, Yunnan Univ. Press, 2009. 15) “China and Africa: Cooperation in 50 Years”, Asia and Africa Today in Russian, Russian Academy of Sciences, No. 12, 2002. 1）”Morsi Visit Opens New Chapter”, China Daily 2012-8-31. 7）“Rediscovering China in Africa”, Beijing Review，Vol.4, No.22, 2012. 10）”Aftermath of Libyan War”, China Daily 2012-4-11. 13）”More Soft Power Needed in Africa”, China Daily 2012-2-27. 19）”China-Africa Cooperation as Viewd from China”, CCA Africa Business Report, Vol. 8, Issue 14, 2011,Washington. 20) “Libyan Conflict Casts Shadow”, China Daily 2011-9-3. 26）“When BRIC becomes BRICS”, East Asia Forum Australia, March.3,2011. 30）”China Offers New Growth Pattern”, China Daily 2009-11-19. 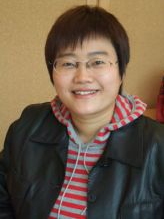 Resume：HE Wenping is Professor and Director of African Studies Section at the Institute of West-Asian and African Studies IWAAS, Chinese Academy of Social Sciences CASS. Specializing on Africa’s relations with China and major western powers, and African democratic transition. She began her researching/teaching career at CASS in 1989, and has served as a visiting scholar at Yale University 1993-1994, London University 1997, the Nordic Africa Institute 2008 based in Sweden and German Development Institute DIE, 2010 based in Bonn. .
Dr. He is Secretary-General of the Chinese Asian & African Research Society as well as Standing Member of the Research Society for African Problems and Asian�CAfrican Development & Exchange Society of China. She received B.A. and M.A. degrees in international politics and a Ph.D. in law from Peking University. Apart from researching and guiding post-graduate students in CASS, Dr. He also serves as a regular commentator of Chinese Central TV Station CCTV and Chinese Central Radiobroadcast, discussing African issues. She is also a regular lecturer on Sino-African relations in various African human resources training classes. Dr. He now serves as associate researcher in the Centre for Chinese Studies of Stellenbosch University in South Africa and a Council Member of the World Economic Forum’s Global Agenda Council on the Future of Africa in 2009 and 2010. 4)“China''s Aid to Africa: Policy Evolution, Characteristics and its Role”, in J. Stillhoff Sørensen ed. “Challenging the Aid Paradigm: Western Currents and Asian Alternatives”. Houndmills: Palgrave Macmillan 2010. 7)“China’s African Policy: Driving Forces, Features and Global Impact”, 《Africa Review》 Vol.1, No.1, Jan.-June 2009, Journal of African Studies Association of India, also collected in “Fifty Years of Sino-African Cooperation: Background, Progress and Significance――Chinese Perspectives on Sino-African Relations”, Yunnan Univ. Press, 2009. 3) “The Answers Lie Within”, Chinafrica, Vol. 4, August 2012, p.24. 4) ”China’s Bond of Commitment to Africa”, China Daily 2012-7-25. 5) ”Power Shifting and Sharing: Egypt’s Foreign Policy ”, China Daily 2012-7-19. 6) ”China-Africa: Long Tradition of Friendship”, China Daily 2012-7-11. 7) “ Laying Foundation for Future”, China Daily Europe Edition 2012-6-29. 8) “Africa’s Economic Transformation”, Chinafrica, Vol. 4, June 2012, p.34. 9)“Rediscovering China in Africa”, Beijing Review，Vol. 4, No.22, 2012. 10) ”Aftermath of Libyan War”, China Daily 2012-04-11. 11) ”BRICS Blazes a New Trail”, China Daily 2012-3-28. 12) “Pushing Integration”, Chinafrica, Vol. 4, March 2012, p.20-21. 13) “More Soft Power Needed in Africa”, China Daily 2012-2-27. 14) “Syria issue Respect for Different Viewpoints”, China Daily 2012-2-16. 15) “Gaddafi’s Death Poses Challenges”, Chinafrica, No.12, 2011, p.11. 17) “Libya Needs China to Rebuild”, China Daily 2011-9-28. 18) ”China-Africa Cooperation as Viewd from China”, CCA Africa Business Report, Vol. 8, Issue 14, 2011,Washington. 29) “Libyan Conflict Casts Shadow”, China Daily 2011-9-3. 30)“Non-Interference in Africa”, Chinafrica, Vol. 3, No.6, June 2011, p.23. 31)“When BRIC becomes BRICS”, East Asia Forum Australia, March.3,2011. 32) “Whose Nerves are Touched by Growing China-Africa Relations?”, International Business Daily China-Africa Economic & Trade Special Edition, Feb. 22, 2011, p.3. 33)“More Yiwu-like Commodity Distribution Centres Needed”, International Business Daily, Nov. 18, 2010, p.6-7. 34)“A Year of Alliance”, Chinafrica, No.12, December 2010, p.15. 35)“Relations with Africa Sound”, China Daily 2010-10-12. 36)“Equal Platform, Mutual Benefit”, China Daily Weekend Edition, July 17-18, 2010. 37)“China Offers New Growth Pattern”, China Daily 2009-11-19. 39)“A Silver Lining: Obama’s Africa Policy”, Chinafrica, Vol. 4, No.1, Jan. 2009. 40)“Piracy Crackdown”, Beijing Review，Vol. 52, No.1, 2009. 41)“Sharing Life Lessons”, Chinafrica, Vol. 3, No.5, May. 2008. 42)“Africa’s Lesson from Obama Win”, China Daily 2008-11-19. 44)“China, India Can Rewrite Asia-Africa Unity Story”, China Daily 2008-4-22 . 45)“Shining New Light on the ‘Dark Continent ’”, Chinafrica, Vol. 3, No.1, May. 2008. 46)“Lessons to be Learnt from Kenya’s ‘Democracy ’”, China Daily 2008-1-17. 47)“China’s Unceasing Efforts to Resolve Darfur Issue”, China Daily 2008-1-3.